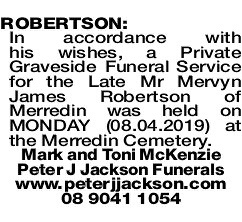 In accordance with his wishes, a Private Graveside Funeral Service for the Late Mr Mervyn James Robertson of Merredin was held on MONDAY (08.04.2019) at the Merredin Cemetery. 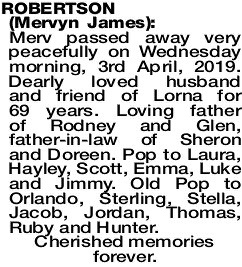 Merv passed away very peacefully on Wednesday morning, 3rd April, 2019. Dearly loved husband and friend of Lorna for 69 years. 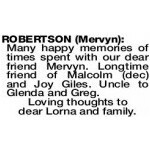 Loving father of Rodney and Glen, father-in-law of Sheron and Doreen. Pop to Laura, Hayley, Scott, Emma, Luke and Jimmy. Old Pop to Orlando, Sterling, Stella, Jacob, Jordan, Thomas, Ruby and Hunter. 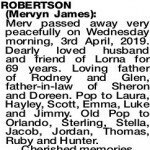 Many happy memories of times spent with our dear friend Mervyn. Long time friend of Malcolm (dec) and Joy Giles. Uncle to Glenda and Greg. Loving thoughts to dear Lorna and family.